This extensive area is variously referred to as "Sutton Pits", "Sutton Courtenay Old Pits", "Appleford Gravel Pits", etc. Much of the area towards Appleford is active gravel workings; this area is dealt with separately, though the two sites are contiguous and the main access to the site (the bridleway running east from Churchmere Road in Sutton Courtenay) passes through both. The private access road to Amey Roadstone is treated as the dividing line. For an approximate location map, click here. A hundred yards or so behind Sutton Courtenay church is an area of disused gravel workings, mostly surrounded by trees. There are also scrubby and grassy areas. Though rarities should not be expected on a casual visit, a stroll round the area can often produce a good range of common species. From A34: Leave A34 at the Tescos (Abingdon South) interchange. Drive past Tescos and the Ock Mill PH to a double roundabout. Turn right (B4017, signposted Drayton). At the roundabout in the middle of Drayton village, turn left (B4016). Keep left at the triangle in Sutton Courtenay village, then when you see the parish church turn right across the green towards the Swan PH. A free public car park is to your right. There are also one or two car parking spaces behind the churchyard, best approached via All Saints Lane from the Fish PH, just around the corner from the church. Much of the site can be viewed from the public bridleway that continues at the end of Churchmere Road. A productive grassy area beyond the wooded pits has recently been designated a local nature reserve (though its exact current status is unknown). A fisherman's path (used by dogwalkers but not a right of way) offers an alternative return to the church and car park. From the car park on the village green, walk down Churchmere Road, looking into gardens as you go (wintering Blackcap and Chiffchaff have been seen hereabouts, and Nuthatches occasionally visit feeders). Beyond the last house, scan the lakes (A) to left and right [photos 1-3]. Both are surrounded by trees, which deters most waders, but a sandbank that appears in dry conditions at the far side of the left-hand lake has produced Green Sandpiper and Grey Heron. Kingfishers are sometimes very obvious in this area, but their numbers seem variable. Various warblers can sometimes be found in the undergrowth to each side. 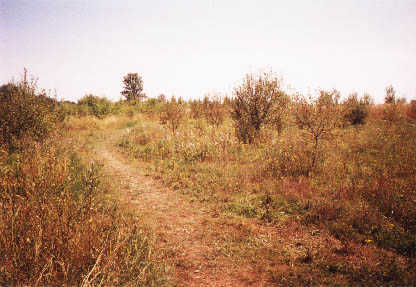 At the end of the wooded area, beyond a vehicular barrier, the track continues with a grassy, scrubby area (B) [photo 4] to the left and open fields to the right. This grassy area has recently been designated a local nature reserve, and is crossed by several paths; a convenient circular route is to walk along the track almost to the ditch at the far end and then turn left and follow an obvious path back; alternatively, turn left immediately you exit the trees and skirt the scrub area with more mature woodland on your left. The grassy area (particularly the fence of the depot at the far side) used to produce regular Tree Sparrows, but this species has been hard to find in recent years. (Tree Sparrows may also frequent the area to the south of here, around Hobbyhorse Lane and beyond, though gravel extraction activity means any good habitat tends to be transient.) More likely are Green Woodpecker, Cuckoo, Linnet, Meadow Pipit, Reed Bunting or Yellowhammer. Butterflies (including Marbled White), cowslips and orchids are also present in good numbers in the appropriate season, and Grass Snake has been seen at least once. In the north-west corner of the grassy area, a fishermans' path (not a legal right of way) gives access to another lake (C) [photo 5]. There is a path completely circumnavigating this lake, but the recommended route along the southern edge gives good views of most of the lake. Various ducks (Gadwall, Shoveler etc.) can sometimes be found in winter, Great Crested Grebes breed and Sand Martins and other hirundines patrol overhead in summer. Kingfisher is also a strong possibility and are known to have attempted to breed nearby, and Grey Wagtail has been seen occasionally. Great Spotted Woodpeckers are frequently seen flying over the lake. The scrub to the left of the path can be good for warblers and other passerines, and Turtle Doves are sometimes heard (and occasionally seen) from here. At the point where the path rejoins All Saints Lane, a group of decapitated trees have produced a few spring sightings of Lesser Spotted Woodpecker, which may breed locally. Turn left, then right alongside the churchyard wall to return to the car park. The churchyard (D) [photo 6] has held breeding Spotted Flycatchers in the past, and good views of Redwing can sometimes be had in the yew trees in winter. Sutton Pools (E), a backwater of the Thames, is an attractive spot [photo 7] that may produce the usual riverine species (Kingfisher, Great Crested Grebe, Grey Wagtail etc.). Walk down the High Street past the church to a sharp right-hand bend and follow a footpath departing on the left. The gravel pits to the south and east of the site described here may also produce something of interest (possibly Little Ringed Plover, or one of the the Didcot Peregrines) - there are a number of rights of way crossing this area, but be aware that temporary diversions may apply. Further afield, see Churn, Abingdon Sewage Farm, Radley GPs. An area of mostly active gravel workings and landfill (F) between Appleford and Sutton Courtenay. Beware that this area changes frequently due to gravel extraction, and footpaths may be diverted. Unofficial car-parking where the access road to an Amey Roadstone depot crosses the bridleway from Sutton Courtenay at SU513939. Very limited and probably illegal car-parking by gate on bend at SU520937 is unsuitable for anything other than a quick scan over the adjoining pits. If you have time, a more rewarding trip can be had by parking in Sutton Courtenay and visiting both sites on foot. From Sutton Courtenay: from the church, head north (away from the green), go round a sharp right-hand bend and pass the Fish pub; keep straight on past the turning to Culham and Abingdon. The Amey access road is on your right just beyond the end of the village; the pull-in mentioned above is a little further on, on the outside of a left-hand bend. Public transport Appleford station (on the Didcot-Oxford line) is approximately ½ mile to the east. Access A currently diverted bridleway leads east-west across the site; some of the open pits are visible from it. Some of the pits may also visible from the B4016. Various waders (Little Ringed Plover, Redshank, Green Sandpiper and Common Sandpiper) have been seen in this area. Also Tree Sparrow and breeding Sand Martin. The area behind the church in Appleford village has produced Tree Sparrow and Corn Bunting. See also Churn, Abingdon Sewage Farm, Radley GPs.